Ricotta Frittata, Thyme for Cooking simple gourmet first course (starter). Put ricotta into a medium bowl and stir to make smooth. Add the eggs, one at a time and stir well. There should be no lumps. Add fennel seeds and stir. Heat the oil in a small nonstick skillet. Add the egg/ricotta and cook over medium heat. When eggs are just cooked through, 8 - 10 minutes, you need to turn it: slide it carefully onto a plate, put another plate on top and turn it over. 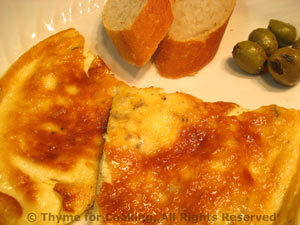 Remove frittata, slice into wedges and serve immediately, garnished with olives, if you have some.